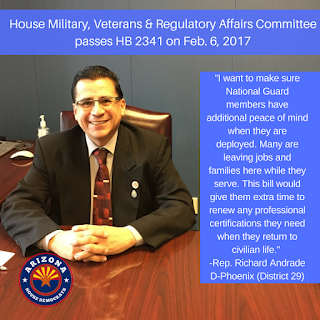 Phoenix Arizona-Rep. Richard Andrade, D-Phoenix (District 29), introduced HB 2341, a bill that would extend the period of time to renew any professional certifications armed services members need when they return to civilian life. To read the entire bill click here. 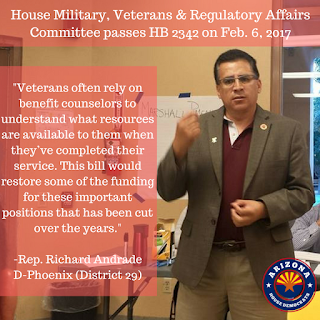 Phoenix Arizona-Rep. Richard Andrade, D-Phoenix (District 29), introduced HB 2342, a bill that appropriates funds to the Arizona Department of Veterans' Services. The funds go to hiring counselors that provide counseling and assistance to veterans, their dependents and survivors. To read the entire bill click here.